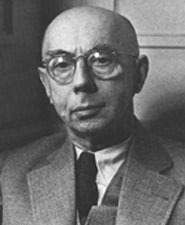 German physicist Gustav Hertz won the Nobel Prize in 1925, for the Franck-Hertz Experiment conducted in 1914 with James Franck, who shared the Nobel honor. Their work helped explain the quantized nature of energy transfer, confirmed Niels Bohr's quantum theory about the existence of the stationary energy states, and laid the foundation for nuclear physics. Jewish by heredity, Hertz was forced out of German academia by the Nazi regime, and he worked on the Soviet Union's atomic weapons program from the close of World War II until 1955. He also studied the infrared absorption spectrum of carbon dioxide, and separation of neon isotopes. His uncle, Heinrich Hertz, discovered electromagnetic radiation.